So this is a new one. 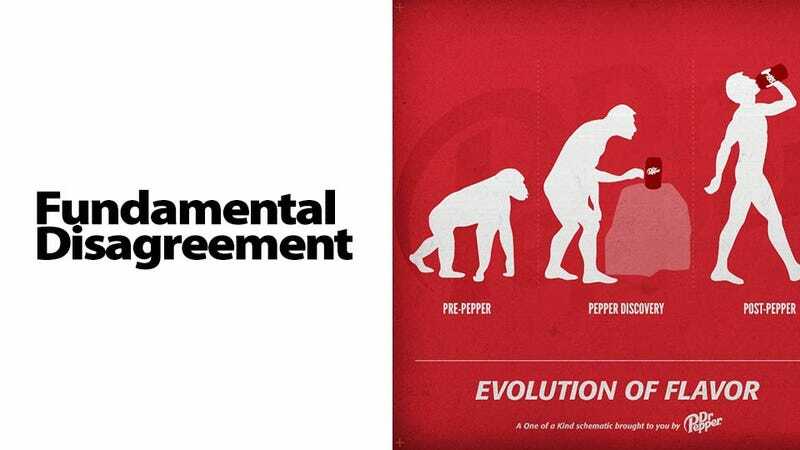 Dr. Pepper made an aggressively silly ad about the "Evolution of Flavor." It shows an early-evolution man finding a can of Dr. Pepper, and BOOM, full-fledged homo sapiens. Funny! And again, willfully goofy. And then it started a culture war. Frank Suarez Trin, your punishment will be more severe because you use the lord's name to spew your hatered. You're the one thats going to hell. Alex Nichols EVOLUTION IS GAY!!!!!!!! Colton Chambers Drink Pepper, Hail Satan. Mark Ritner dr. pepper is made with addictive mugwump jism and satan's ball sweat! if you drink it, you'll be cursed with a permanent priapism!